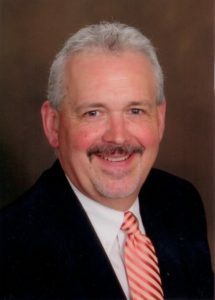 David Michael Brown, age 59, of Commerce went home to be with the Lord Saturday, April 13, 2019. David was a 1978 High School graduate of Herscher High School in Herscher, Illinois. He also attended Olivet Nazarene University. David was in the grocery business for 35 years and was district manager for 16 years at Hobby Lobby. David was a loving son, husband, father, and beloved Poppy. Survivors include his wife of 24 years Sherri Lawson Brown; mother Alice McCabe Brown; son Grant Brown and wife Tara; daughters Candice Campbell and husband Nic; and Emily Brown; brothers Daniel Brown and late wife Tami, Jim Brown and wife Terriann; 5 grandchildren Kylianne Joye, Judah David, Keirra Mae, Lillian Abigail, Lyanna Michelle and a host of other relatives. He is preceded in death by his father Dale Brown. A Celebration of Life will be held 6:00 pm Tuesday, April 16, 2019 at Hamilton Mill Christian Church, 3809 Sardis Church Road, Buford, GA, 30519. Pastor Bob Mahan and Pastor Nic Campbell will be officiating. The family will receive friends 4:00 pm to 6:00 pm Tuesday, April 16, 2019 at the church. Arrangements by Lawson Funeral Home, 4532 Hwy 53, Hoschton, GA, 30548, www.lawsonfuneralhome.org, 706-654-0966. Sherri and family, I am so sorry to hear of the loss of such a wonderful man. Mr. Brown was one of the nicest people I have ever known. I always looked forward to talking to him when I was an employee for Hobby Lobby. I never forgot him or his smile. May God be with you during this difficult time.